I have one of the smallest kitchens in the world. You can stand in pretty much any part of it and touch pretty much any other part. Sometimes – like when you’re unloading the dishwasher – this is great: you only have to reach out an arm to find the appropriate cupboard and put things away. You don’t even have to move your feet, never mind actually walk anywhere. At others – like when two of you want to do anything in there at the same time, or you want to cook and chat to a child or a guest, or you want to find a place for a new mug, it’s impossible. However, the minuteness of my kitchen is a small price to pay for living in London. Sometimes. And yesterday was one of those times. The day dawns cold and frosty. Christmas is approaching. The children are on holiday; I need a dose of culture. I make a picnic, sling it in a backpack and we head for the bright lights. By which, of course, I mean the V&A. I want to see quilts (something to do with the new book) and I have promised the boys lots of lovely old weapons to keep them happy. On the way, there is a slight misunderstanding. Tom hears ‘V&A’ as ‘DNA’, which reminds him of the bit in Jurassic Park when the canister of dino DNA is stolen by the sweaty baddie and ends up floating out to sea. Tom doesn’t have a problem AT ALL with the sweaty baddie being eaten alive by an angry dinosaur in the process: he’s just worried about that canister. I keep on having to reassure him that it’s OK. So anyway, obviously by now Tom assumes we’re going to see not patchwork, but dinosaurs. But at this point we are in South Kensington and we can see the beautiful, multicoloured towers of the Natural History Museum across the road from the V&A. So I promise him both. I also remember reading recently that the Natural History Museum used to be so blackened and ugly from coal soot (it was like that when I first knew it as a schoolgirl) that the council wanted to pull it down and start again. Instead, there was a campaign to save it and for years it was under scaffolding, while they sandblasted off all the soot. Up until then, we had always associated Victorian architecture with dark, lumpen ugliness. But suddenly, when the museum was eventually revealed, we realised that after all, those Victorians were really REALLY good. The Natural History Museum is one of the most beautiful buildings in London, AND it’s got a skating rink outside at the moment AND it’s got dinosaurs inside. Moving ones. What’s not to love? As always, I mentally thanked Prince Albert – the Steve Jobs of his day – for having the idea and making it happen. But first, the V&A. As usual, we fell in love with everything in the shop. Then we asked a nice man at the members’ desk where the quilts and weapons were. He sadly informed us that they only had quilts on display for a one-off exhibition and there are none to see now. Also, they don’t really ‘do’ weapons at the V&A, as it’s all about ‘the applied and decorative arts’ – not killing people. But I knew better. I took the boys to the Japanese section, because those eighteenth century Japanese artists knew a thing or two about applying the arts to Samurai slung swords, blades, daggers, armour and really scary helmets. There were two cases of them. Job done. There was also, as it happened, a temporary exhibition called ‘The Power of Making‘, celebrating all sorts of crafts, from dry stone walling to saddle making, dress making, gun making (more guns – hah! ), 3D-printers (the future), cabinets, bicycles, artificial eyes, shoes with guitars on … And yes, there was a quilt, with direction-sensing er … sensors on it, so it could map the shape of whatever it was thrown over. Also some needlework, done by British officers captured by the Nazis and containing a secret code. It was PERFECT. We could hardly drag ourselves away. 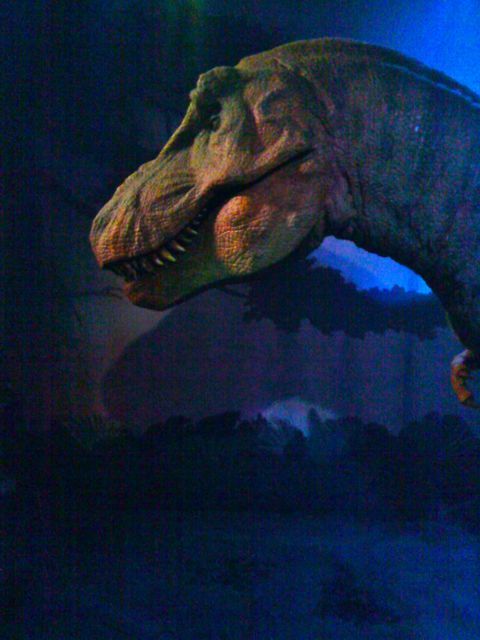 After some restorative cheese and peanut butter sandwiches, we headed off for those dinosaurs next door. We spent ages in the dinosaur section, watching the pretend moving ones, admiring the bones of the very dead real ones, learning far more about them and their times than we ever intended to. Tom bought a cuddly stegosaurus called Steggie and we were done. Harrods was a bus ride away. We used to go there for the Krispy Kremes, but they don’t do them any more. Instead, we happily window-shopped, the boys posed beside a couple of teddy bears that were at least four times their size (and cost £2000 – go figure), and I managed to buy a secret Christmas present without incurring shipping charges, so I actually saved money. All in all, we were out for most of the day, before driving home across my favourite bridge (Albert) – working again and lit like a Christmas tree. We learned loads. We saw lots of beautiful, beautiful things. The children were enchanted and so was I. Apart from shopping, the total cost was one bus fare. As I say, a tiny kitchen is a small price to pay. * And in case you don’t know the film already, do look out for ‘One of Our Dinosaurs Is Missing’. It is mad, and funny, and features the star diplodocus of the Natural History Museum. Not many films can say that. 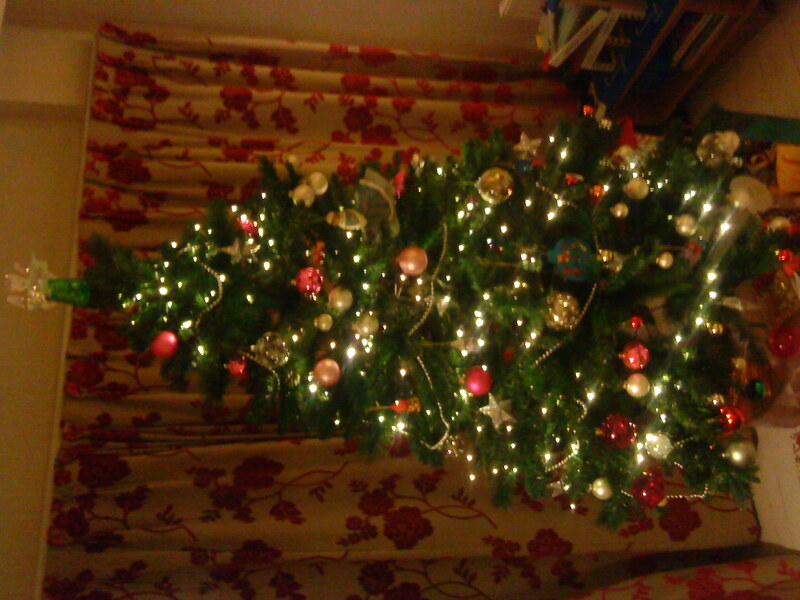 The five year-old did most of the tree this year. This was because he did an awesome job on the bits he could reach last year, but they were only about the bottom two feet of it. This time, he did the whole bottom half and I mirrored the effect as best I could on the top half. My lovely editor, Imogen, has asked for a picture, so here we go. As one waiting period starts (I love Advent), another one finally ends. I took a couple of days to judge the ‘The Girl in the Picture’ competition because all the entries were great (THANK YOU, guys!) and there were about 10 I really loved, and it was almost impossible to pick my winner and runners up from among them. But I’ve done it, and if you want to know who I chose, go to www.threadsthebook.com and check out the Competition page. If you’re one of the winners, I’ll be contacting you soon to sort out getting your prize to you. And don’t forget, if you didn’t win, but you’d still like to get the Threads series to give to a friend (or friends) for Christmas, you can get the set from The Book People here, for less than £5. What a bargain! Or – even better – you can go into your very fabulous local independent bookshop and get them to order them for you. They’ll arrive very fast – they have the most amazing ordering system – and you’ll make an independent bookseller very happy, which is a good thing to do at Christmas time. Enough about buying books. Well done again to everyone who entered the competition. When I have a moment, I’ll put up the winning entries in a gallery on the threadsthebook site, so you can admire them all.